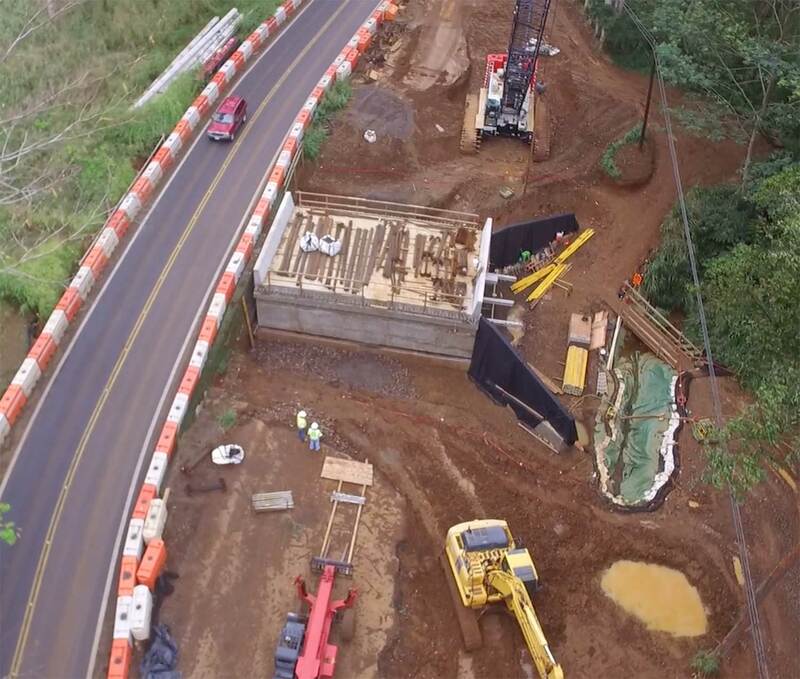 W.W. Clyde built a bypass road near Koloa, Kauai for the purpose of diverting the traffic on State Road 50 in order to remove a 90 year old box culvert and build a replacement. To support the new bridge, 24 piles were driven with a new slab and cast in place walls and suspended deck. The existing two-cell box culvert structure was replaced with a single-cell box culvert structure that is longer and wider than the existing structure. The new structure continues to carry two travel lanes, with a 44-foot-wide typical section consisting of two 12-foot-wide lanes, two 8-foot-wide shoulders, and two 2-foot railings. A temporary two-lane bypass road and stream crossing was built on one side of the mountainside of the highway to accommodate existing traffic during construction. The project also include scour protection measures, supporting walls and slopes, utility relocations, and temporary staging areas.